Fabio Capello was officially unvailed today as England's new manager after signing a four-and-a-half- year deal with the FA worth 6.8 million pounds.The Italian has replaced Steve Mc Claren after his dissappionting spell as England coach which saw him fail to qualify for the Euro 2008 after loosing to Croatia 3-2. Capello has brought along his long-time friend and work c ollegue Franco Baldini as well as Italo Galbiati, both will be his assisants, while goalkeeping coach Franco Tancredi and fitness coach Massimo Neri will also join Capello's coaching staff. The ex-Real Madrid manager has descirbed this move as a "dream come true" and his first objective is to learn the English language; "In one month when I meet the players, I want to be able to speak to them in English." 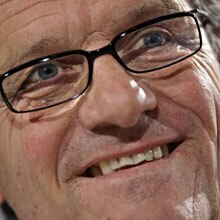 Capello also widened the smiles of all English football followers as he went onto say that he had no problem in beating his nation Italy; " If Italy and England meet in the World Cup final in South Africa I will happily beat them." A lot of English football fans are happy with the capture of one of the best coaches in the World but the result will be the one that will determine if the Italian stays or goes.